Established in 2013, MWC Sports Complex is a complete soccer, wrestling, and baseball academy for boys and girls 18 years and younger. Whether you want to introduce your pee wee to his/her first sport, or help your established athlete get a college scholarship, we're here to help you succeed. Our complete facility includes two indoor Turf fields, a multi-purpose area, wrestling mats, fitness center, and our outdoor fields opening in Spring 2018. Along with soccer, wrestling, and baseball our facility can be used for a variety of different activities that have included: Football, Lacrosse, Softball, Cheer, and Strength & Conditioning. However, space is always available with notice if you would like to run your classes here. Whether it be zumba, yoga or any of your favorite indoor activity, feel free to contact our facility to rent out a space. Come on by and check us out for your specific needs or contact us if you have any questions! WE OFFER SPEED AND AGILITY TRAINING, FITNESS TRAINING, FUNCTIONAL SKILL TRAINING,TECHNICAL TRAINING, AND TACTICAL TRAINING. 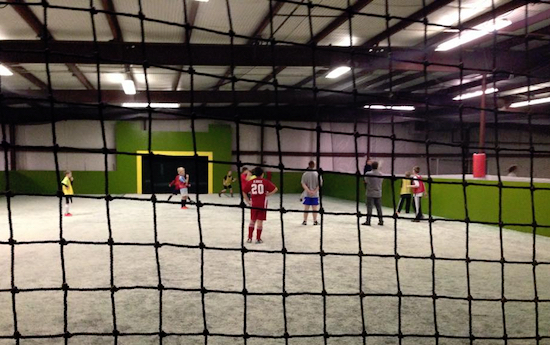 INDIVIDUAL OR GROUP SESSION ARE AVAILABLE AND CAN BE SETUP AND SCHEDULED TO FIT ANY PLAYER OR GROUPS NEEDS. Conveniently located in Youngsville right outside of Wake Forest. Facility is located off of Capital Blvd (across from Stock Building Supply). which is located in the back of the building.